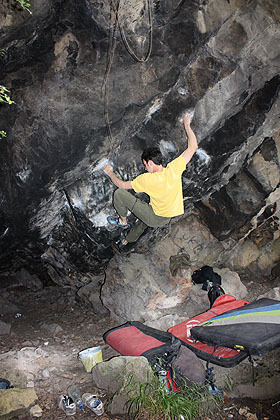 This afternoon Chris Doyle completed the well known cave project line on the Sugar Lump block, situated just up the hill from Elephant’s Cave on the Llandudno Great Orme. Tramps Tea Party 8A tackles the prominent groove line exiting the right side of the cave on the top side of the Sugar Lump. 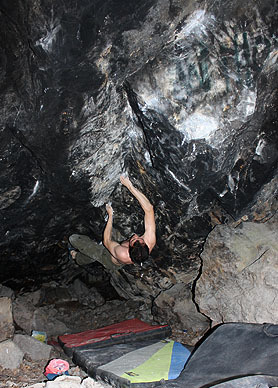 The problem starts sitting with a good jug for hands and then follows a complex and sustained sequence (14 moves in total) to an obvious finish on good jugs right of the cave entrance. The line was briefly tried by Kristian Clemmow and Si Panton back in the late 90s, but after a fire was lit underneath, leaving the rock blackened with soot, they left it alone. It remained unbothered until last year when Chris cleaned it up and started working out the moves. 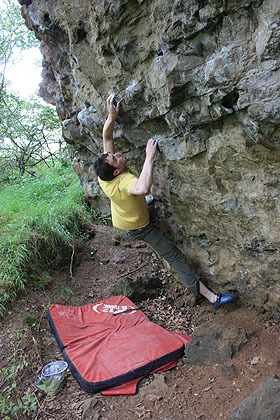 Earlier this year Chris was getting close to sussing it out but the presence of a large block was cramping the natural foot sequence. 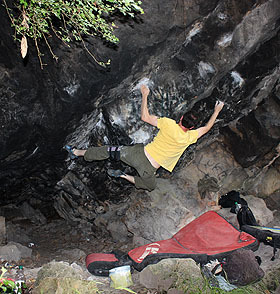 Neil Dyer came up for a session on it and then without telling Chris he returned with a block and tackle to drag the offending block free from the base of the problem. Arriving back at the crag a week later Chris was mystified by the shift in the position of the block. Eventually it dawned that it must have been Neil who had done the charitable deed. More intense sessions followed but the best sequence was stymied by one stubborn foot manoeuvre that just wouldn’t work. Finally, a few weeks back, Chris cracked the code and a do-able method emerged. 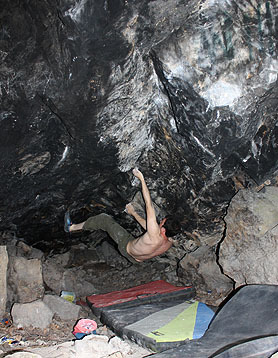 Even with the new sequence the successful redpoint remained elusive; in the end it took another three sessions before he made it to the jugs at the end. To see a film of Chris's ascent go to his blog. NB. The steep little wall just up to the left was quite popular for a while in the mid 90s. It has long since fallen out of fashion but is actually quite good for eliminates.